Another day at home with my 4-year-old, and I decided it would be a good idea to clean the carpets. I’d put our overgrown labradoodle puppy in the yard while my toddler played in his room. This wasn’t one of those quick vacuum jobs. Our tan carpet displayed remnants of a variety of spills and stains. You know, the ones that had been scrubbed by hand, but never quite disappeared? This job called for the heavy machinery, so I broke out the rug steam cleaner. Two hours of heavy labor passed and my little angel entertained himself the whole time. The tan carpet looked like new. Just as I finished, Garrett ran to the back door to let Teddy the labradoodle back into the house. After it had rained, and he’d been digging in the mud. This wasn’t just a small explosion either. I screamed at him. I yelled at my preschooler who was only trying to help. Tears come to my eyes now as I recall the memory. Oh how I wish I could have a do-over of that day. What I didn’t realize at the time was that as a stay-at-home mom, certain things triggered my harsh reactions. It didn’t have anything to do with Garrett’s behavior at all. Sleep deprivation, a messy house, and limited time to recharge often set my nerves on edge. I struggled as I walked through that time of motherhood. Eventually, through intentional prayer and time spent with other moms I was able to identify potential angry outbursts before they left my mouth. I learned that I wasn’t alone. I also discovered certain habits that helped me along the way and found encouragement from friends and family. Recently I learned of a new resource for moms of little children, written by two women who understand my story. These ladies want to equip moms to say ‘no’ to anger and replace their reactions with gentle biblical responses. Triggers: Exchanging Parent’s Angry Reactions for Gentle Biblical Responses examines common parenting issues that cause us to explode inappropriately at our children. Moving beyond simple parenting tips on how to change a child’s behavior, Amber Lia and Wendy Speake offer biblical insight and practical tools to equip and encourage moms on the journey. I just had to share this resource here, because I’ve been there. Maybe you’ve been there too. I share this with you today because I believe in the message, and I believe in the hearts of the women who wrote the book. If you know a young mom who could use a little encouragement today, feel free to share this post with her. I want her to know she’s not alone, and there is hope. Today, the Triggers book is available for purchase. Click the picture below to take you there. We conclude this series on raising daughters with a guest post by someone dear to my heart. Sabra Penley is not only a genuine lady, but also a gifted communicator and teacher of God's Word. You will be blessed and challenged by her post as she shares about when our role as a mother changes. As I gazed into those big blue eyes looking back at me, soft tears ran down my cheeks. There I was, cradling this precious little one in my arms, who just days before had been inside me. This tiny pink bundle of joy had changed my life forever. I was a mother. And she was depending on me. Overwhelming love filled my heart and a wave of sadness washed over me that in eighteen short years my daughter would be leaving home. Mothering is like that, you know? A rollercoaster of emotions that leaves you laughing and crying and sometimes feeling a little sick to your stomach. But it’s a ride you never want to stop…all because of overwhelming love for your child. My bundle of joy is a beautiful new bride. And with the words “I do,” she left our home, for good, to go make her own. I’ve been riding that wild rollercoaster over and over these last few weeks—so excited for her and her new husband, excited to get back to “just the two of us” with my husband, yet bittersweet that life has changed forever once again. One thing’s for sure—a mom never stops being a mom. But our role as moms looks a little different when our daughters are grown. We are no longer responsible to provide for their every need. And the decisions of life are all theirs to make, along with facing the consequences of those decisions. As a mother, this can be hard to accept. It’s hard to loosen the apron strings and watch them go off on their own. If we don’t, though, we’ll move from mothering to smothering. And that is not part of God’s plan. But, take heart! Our responsibility is far from over. Our daughters still need us—just not in the same way. Hannah’s prayer must become our prayer as our little girls become young women. Maybe the hardest, most important, thing a mother can do in her daughter’s life is give her over to the Lord when she becomes a woman and trust Him to take care of her. How do we do that? On our knees…each and every day. Praying for our girls throughout their lives is the most precious and powerful thing we moms can do for them. We can never do it too much. And we can never do it wrong. For we have this promise: “…the Spirit helps us in our weakness. We do not know what we ought to pray for, but the Spirit himself intercedes for us with groans that words cannot express…the Spirit intercedes for the saints in accordance with God’s will.” We may be unsure what the best thing is to pray for, but the Holy Spirit goes to the Father on our behalf and prays that best thing—His will. Prayer is powerful. Prayer brings peace. 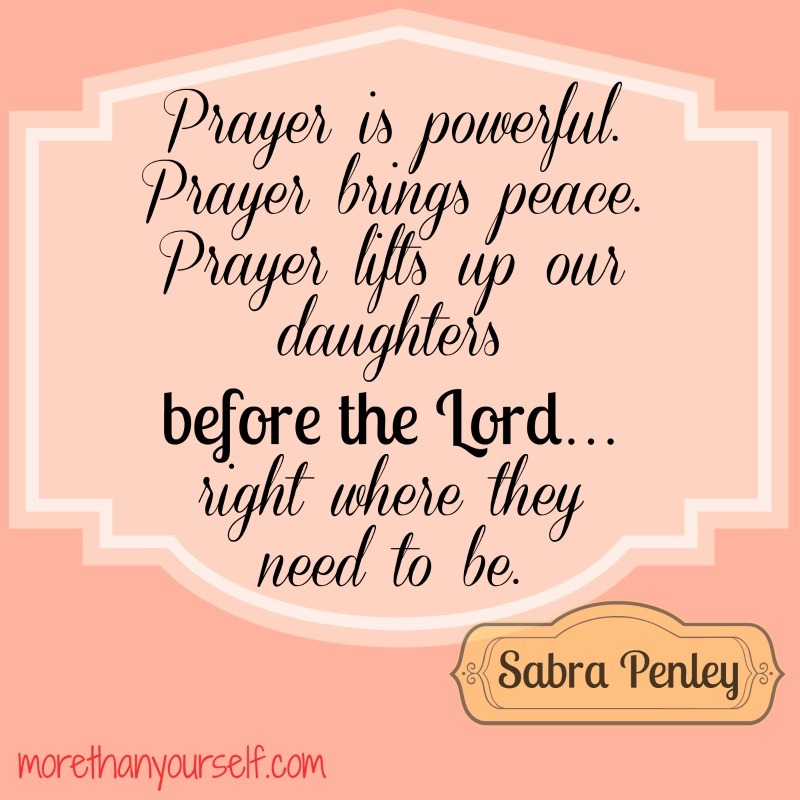 Prayer lifts up our daughters before the Lord…right where they need to be. In addition to prayer, we moms must be available—to listen, encourage, support, and give counsel when our daughters are open to it. They need to know they are always welcome and always loved. And we must remember what our younger selves were like. We made mistakes (and still do). We’re all a work in progress. Our daughters will make mistakes, too. And hopefully, we all learn from them and grow in understanding and maturity. When we relate to what our daughters are going through, we can give them the space they need and yet stay close enough to be a strong support. Our daughters leaving home to go off on their own may bring tears to our eyes, but they don’t have to be tears of sadness. It’s just a new stage—an exciting stage—in both of our lives. A stage that can draw us closer than ever, even though we’re living apart. That rollercoaster ride isn’t over the day our daughters leave home. For a mom, it never stops. And I, for one, am glad it never ends. Sabra Penley is a woman who loves the Lord Jesus and strives to bring Him glory each day, although she’ll tell you most days she falls short. She married her sweetheart 37 years ago and they have two grown kids—a son and a daughter (who just got married). As a new empty-nester, Sabra looks forward to a simpler season of life—taking life one day at a time, living with less, and finding joy in the details. Together with her husband, David, she writes a blog about living married life according to God’s Word at www.simplyoneinmarriage.com. You can also connect with her through www.twitter.com/SabraPenley and www.pinterest.com/savedsaver. Life is better with a little daily encouragement. For more uplifting posts and wisdom from God's word, visit the links in the sidebar to the right. You will find wonderful devotions on these sites - #raralinkup, #intentionaltuesdays, #tellyourstory, #livefreethursdays, #dancewithjesus.